In the Caribbean you will see these everywhere. It is actually the official flower of the US Virgin Islands and the Bahamas. Today there are several varieties of Yellow Elder. Some are shrubs around 5' in height, others can become small trees around 20' or so. 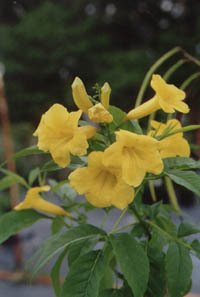 Tecoma stans blooms mostly during the warm weather, specially during the spring and fall. The spent flowers should be removed to encourage bushiness and in some varieties to encourage more flowers. Well grown plants can become covered with yellow flowers that have a very good sweet fragrance also. It is known to attract hummingbirds, butterflies and/or birds. Water is average during the warm weather and a little less during the winter when the plant can loose quite a few leaves depending on the temperatures. The Yellow Elder is a tropical plant. Established plants can withstand temperatures in the high 20°s for short periods of time but it is best if kept above freezing all the time. For cold climates the dwarf varieties are more appropriate because they can be grown in pots and brought in during the cold weather easily. Check out Tecoma stans 'Dwarf'. It only grows to around 4 feet.